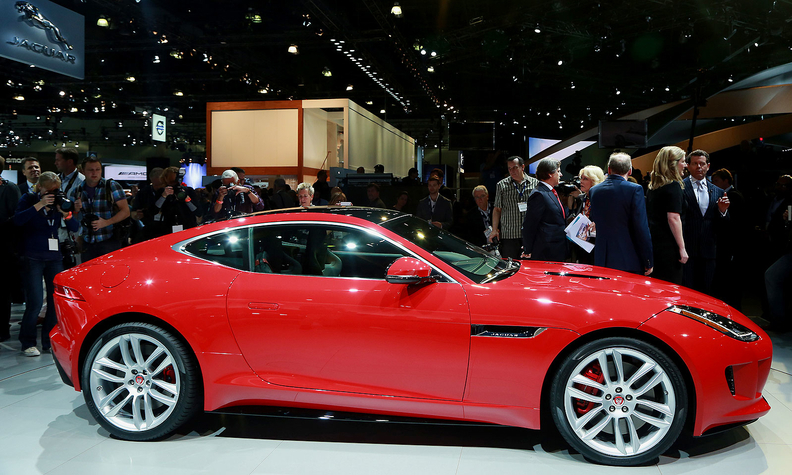 The F-Type has helped boost Jaguar sales. The brand is launching a coupe version, pictured at the LA auto show in November, to join the convertible already on sale. NEW DELHI (Bloomberg) -- Jaguar Land Rover reported record global sales last year, driven by growth in the Asia Pacific and China region. Jaguar Land Rover's total worldwide sales rose 19 percent last year to 425,006 vehicles. Jaguar brand sales jumped 42 percent to 76,668 vehicles, the most since 2005, while Land Rover increased 15 percent for an annual record of 348,338 vehicles, the company said in a statement on Sunday. Sales in Asia Pacific and the China region jumped 30 percent during 2013, North America rose 21 percent, the U.K. grew 14 percent, mainland Europe 6 percent and other overseas markets increased 23 percent, according to the statement. Jaguar Land Rover, which Mumbai-based Tata Motors bought from Ford Motor Co. in 2008 for $2.5 billion, accounted for 72 percent of group revenue and 88 percent of operating profit for the year ended March 31. In the quarter ended in September, Tata Motors posted profit that beat analyst estimates as rising Jaguar Land Rover sales outweighed a loss at the parent company's Indian business. "It's more of a Jaguar Land Rover story now for Tata Motors," Ronak Sarda, Mumbai-based research analyst at Emkay Global Financial Services, said. "This provides a good time for investors to make use of the JLR story as Tata Motors is not generating anything positive in India." Under Tata, Jaguar and Land Rover have targeted emerging markets such as China and Russia for growth. In 2013, Jaguar Land Rover had record sales in 38 markets, including Russia, Brazil, Korea and Canada. The sales growth in 2013 was driven by Jaguar's F-Type convertible and Land Rover's Range Rover and Range Rover Evoque models. The F-Type began shipping in May. It was "a great year in which we have seen some incredibly exciting new models launched to customers across the world," Andy Goss, Jaguar Land Rover Group sales operations director, said in the statement. "The Range Rover Sport, F-Type, new engines and drivetrains, and a number of 14 Model Year enhancements to our existing lineup have seen Jaguar Land Rover continue to build strong sales momentum in every global region," Goss said.